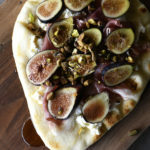 Honeyed Prosciutto Fig Flatbread Recipe - This quick flatbread recipe makes an elegant appetizer recipe that is just as scrumptious as it is beautiful! Arrange Naan or flatbread onto a serving board or platter. Spread the ricotta cheese on top of the bread. Arrange the prosciutto and fig slices. Drizzle with the honey and top with the chopped pistachios. Slice and serve.